3herosoft DVD Ripper is powerful DVD Ripping software which can rip DVD movies to almost all popular video and audio formats such as WMV, 3GP, AVI, MPEG4, RM, DivX, MOV, XviD, FLV, SWF, AC3, M4A, MP3, WMA, WAV, AAC, etc.It supports almost all popular portable devices such as iPod, Zune, iPhone, Apple TV, PSP, Xbox 360, PS3,Smart Phone, Pocket PC, PDA, Mobile Phone, Archos, Archos, iRiver PMP-100, Creative Zen Vision, etc. ...... Phone, Pocket PC, PDA, Mobile Phone, Archos, Archos AV500, Archos AV700, Archos GMini402, iRiver PMP-100, Creative Zen Vision, etc. 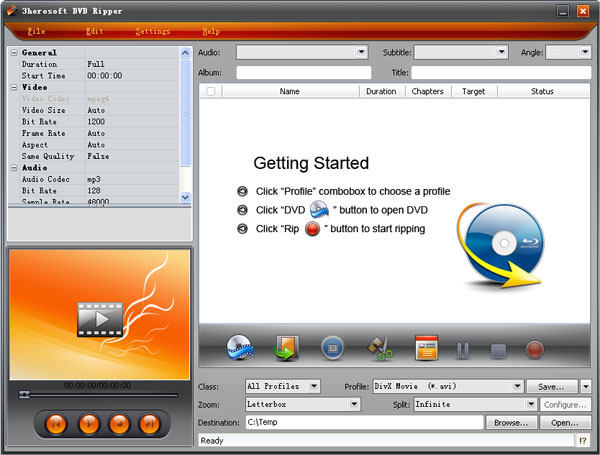 3herosoft DVD Ripper is an ideal choice as a DVD Ripper and converter software. Qweas is providing links to 3herosoft DVD Ripper 3.8.8.0214 as a courtesy, and makes no representations regarding 3herosoft DVD Ripper or any other applications or any information related thereto. Any questions, complaints or claims regarding this application 3herosoft DVD Ripper 3.8.8.0214 must be directed to the appropriate software vendor. You may click the publisher link of 3herosoft DVD Ripper on the top of this page to get more details about the vendor.